Mesa Coyoacan Owners Set to Open Mexican Food Trailer on Metropolitan Ave. The food truck is a restored 1946 trailer found by the 3rd Ward arts collective in a lot in Ithaca, New York. WILLIAMSBURG — The operators of a popular Graham Avenue restaurant plan to open an upscale, art deco version of a Mexican food truck on a busy Williamsburg corner. The owners of Mesa Coyoacan are set to open Zona Rosa at the corner of Metropolitan Avenue and Lorimer Street, inside a shiny 1946 trailer that will serve up everything from tacos to margaritas. The trailer will be located on the semi-enclosed plot of land formerly home to the 3rd Ward arts collective's cafe Goods. Co-owner Jorge Boetto said he hopes to include table service, margaritas, draft beer and long hours — ideally from 8 a.m. to 4 or 5 a.m., to catch L train commuters and late-night revelers. He hopes to debut the new venture in April. "Zona Rosa is a neighborhood in Mexico City that in the '50s and '60s was a real party neighborhood," he explained, calling the era "the golden age of Mexico." Mesa Coyoacan's chef and co-owner Ivan Garcia will design an all-organic, simpler version of their current restaurant's menu, and the trailer will act as kitchen, Boetto noted. Patrons can walk up to the trailer, sit in an enclosed space surrounding it covered in skylights, or plop down at outdoor sidewalk tables, the owners explained. "We're about to start construction," Boetto said, noting that he and his two business partners still have to add running water and bathrooms, which were lacking when 3rd Ward operated its cafe there. 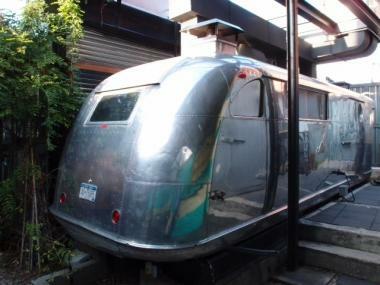 In 2009, members of 3rd Ward rescued the abandoned trailer from a junkyard in Ithaca, N.Y., gutted and renovated the structure, and set it on the previously empty Lorimer Street corner. But the arts collective's venture did not last, Boetto explained. "They weren't restaurant people," he said, adding that he and his colleagues bought the trailer from 3rd Ward in August. "They were architects and artists."